As most of you can imagine, my favorite game to play as a child was Monopoly. Cash was not just king; cash won the game. Yes, if you had no cash you could borrow money, but the only way to do that (within the rules of the game,) was to mortgage your property. You would recieve the value of the mortgaged property and if someone landed on your property they didn't owe you rent, which was the price you paid. This would be terrible in real life. It was so frustrating to play the game of Monopoly, land on that one property that would complete your monopoly, and hark: NO MONEY! I learned to keep a stash under the board; that way I had money to sieze on any opportunity. Buying a new pair of shoes is not considered an opportunity unless the only pair you have got destroyed in a fire while they weren't on your feet, which would be when you were sleeping since that's the only pair you have. Well, you get the point. Say you have to buy a new set of tires for your car. That would be considered an emergency since you need transportation. If you didn't have the emergency fund, which should be in a liquid account, then you'd have to go into debt. This is why we establish the emergency fund as we're paying off our debt. Interest is intrinsic and it's insidious. Since you didn't have the money in an emergency fund for the tires, you have to put them on your credit card. But wait...you got lucky: the tires are on sale. If you finance something and it takes you several months to pay it off, depending on the interest rate you're charged, it could double the amount you paid for the item. You bought that set of tires that was on sale, but by the time you've paid for the tires, they really weren't on sale after all. Get Liquid; Get The Point? 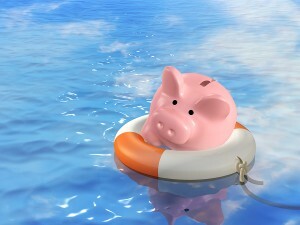 Having an emergency fund in a liquid account, one that you can go down to the bank RIGHT NOW and withdrawal, is vital. You avoid having to pay more than the purchase price for life's surprises and you'll have peace of mind knowing you can cover them. What are some of the things that came up unexpectedly recently that you didn't have the money for?